Some of the best gardening ideas come from nature. Mulching - one of the very best gardening ideas when it comes to rhododendrons - is one of these. In their wild homelands rhododendron roots are covered with nature's own debris of leaves, twigs and whatever else finds a resting place about the plant. This cover, gardeners have discovered, is beneficial, if not downright essential, for the shallow rooted rhododendron. When gardeners take matters into their own hands and do the spreading themselves they call it "mulching", and the material they cast about is, of course, called "mulch". The benefits of mulching are many, some of which are obvious to any gardener with a little common sense and others of which need explanation by trained scientists. The first of these benefits is that mulching conserves moisture by physically holding it and releasing it slowly to the soil beneath. Since rhododendrons like a damp soil, this is an obvious plus. Mulch also conserves moisture by reducing evaporation by up to 90 percent. The results of this conservation is that the need for external water is reduced by one third to one half of that needed for un-mulched soil. Mulches also moderate soil temperature. Mulched soil is up to 10 degrees C cooler on hot summer days and up to 10 degrees C warmer during chilly spring and fall nights, extending the growing season at both ends. Most plants, in fact, virtually cease taking up food and water when the soil temperature is below 6 degrees C (43 degrees F) or above 30 degrees C (86 degrees F). Nature can at times be excessive, and mulches can protect the rhododendron from nature's intemperance. Erosion from heavy rain and winds can be moderated by mulch. Soil compaction from heavy rain and hail can be prevented. The heaving of roots by frost can be prevented as can the drying of roots by high temperatures and winds. Mulch can even prevent the uprooting of the whole plant by winds. The shock from sudden changes in temperature can also be moderated by mulching. Humans, however, can be even more excessive than nature, and mulching protects the rhododendron from their lack of restraint. Mulching can protect the plants from soil compaction due to foot and cart traffic, cold water on hot days and overdoses of water, fertilizers, pesticides, fungicides and salt deicers on sidewalks and roads. Salt is very destructive of the biological life of the earth and of the tiny feeder roots through which plants take up their nourishment. An organic mulch locks up and hastens the degradation of these soil and plant poisons. Much to the gardener's liking, a mulch can help eliminate weeds under the rhododendron. Not only does it lessen the work load but it reduces the competition for moisture, nutrients and sunlight. Besides, removing the weeds can cause damage to shallow rooted plants. Mulching can minimize damage caused by insects and disease by curbing "back-splash inoculation", slowing their growth cycles. It helps prevent the spreading of disease spores by foot traffic, and some mulches even repel insects and combat diseases. Plants that are undernourished and in distress will produce more carbohydrates than proteins. Insects will zero in on these plants since they are attracted to plants high in carbohydrates. 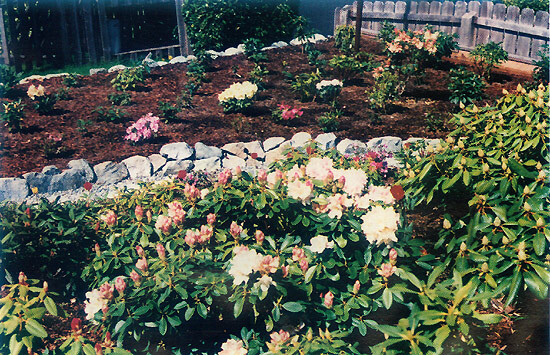 Mulching also helps protect the lower leaves of sprawling rhododendrons from dirt contamination and loss from insects and fungus. By maintaining a dry, sanitary work environment, gardening is made more pleasant. Moreover, mulch creates an attractive background accent for your plants. Pleasing visual effects can result through the use of different mulch textures and colors in combination with plants of various structures and colors. One of the most beneficial aspects of mulching, however, is the improvement it brings to structure and fertility of the soil. Mulching establishes a cool, moist environment where bacteria and other micro-organisms (e.g., worms) can aid in the decomposition process. This process, among many other things, produces humic acid, which helps release bound-up materials such as phosphorus and iron to the soil, carbon dioxide to the plant for use in food production and ammonia, a form of nitrogen plant food, to the plant. As a general rule, the more organic material there is in a soil, the less important the pH level will be and the more flexible your rhododendrons will be in their ability to grow in a range of pH levels. garden is only one of many possible mulches. The wide range of potential mulching materials gives gardeners a chance to let their imaginations soar. Among the organic, inorganic and living mulches is an almost infinite number of possibilities. Following is a sampling of possible organic mulches: seaweed, kelp or eel grass; shredded bark, wood chips or sawdust; straw, hay or grass clippings; compost, mushroom compost or various rotted manures; hulls, shells or cones; conifer needles and twigs; coffee grounds and tea leaves; ground oyster shells or egg shells; ground corn cobs or shredded sugar cane; shredded cardboard or whole or shredded newspaper; peat or sphagnum moss; rotted wood; leaves; burlap sacks; and bracken fern. Most of these mulches are acidic, but some such as crushed oyster and egg shells are alkaline. Determine the correct pH for your particular application. Rhododendrons, of course, like acidic conditions. Some carbon-rich materials such as fresh sawdust, newspapers and straw temporarily take nitrogen from the surrounding soil, causing plants to become yellow. Neutralize this situation by applying a nitrogen-rich material in combination with one high in carbon, or spread a nitrogen fertilizer on most soils before applying carbon-rich mulches. Examples of carbon-rich mulches are: straw, sawdust, bark, ground corncobs and leaves. Nitrogen-rich mulches include cottonseed meal, manure, blood meal, grass clippings and compost. Inorganic mulches provide a permanent mulch which will not break down. Among the possibilities in this category are: rocks, bricks, boards, gravel, solid plastic sheeting (black or clear), perforated clear plastics, fiberglass wool, kitty litter, aluminum foil and expanded vermiculite. Most of these materials are designed to be used in a special situation. Living mulches include the ground covers such as grass, periwinkle and other plants that can be used to satisfy certain landscaping requirements. When a mulch should be applied depends upon your climate. In the moderate Pacific Northwest, mulches should be applied in spring after the soil has warmed up. Be sure the soil is moist before the mulch is applied. Top up mulch in the fall before the temperature drops off. In warm climates such as Florida or California, maintain full mulch all year round. In cold climates such as Prince George, apply mulch in the fall after the ground has frozen to one inch. Uncover in the spring and after the frost danger has passed, recovering again before the heat of summer. Alternatively, spread black plastic over the mulch in the spring and remove after the soil has thawed and warmed sufficiently. But remember, never mulch a heavy, waterlogged soil. - Coffee grounds: one-half inch. - Bark mulch: three inches. - Needles and small twigs: four inches. - Seaweed or straw: five inches. Once you begin using mulches on your rhododendrons you will see the benefits of imitating nature in this rewarding garden activity.